Hawaii State Representative Ken Ito visited both Kosrae and Pohnpei in November to meet with COFA veterans and get a better understanding of the challenges they are facing when they return home after service. This past summer Rep. Ito co-sponsored a resolution at the National Conference of State Legislatures strengthening the call throughout all 50 States to the National Congress in Washington DC to work with the Veterans Administration to address these issues. This was Rep. Ito’s first visit to the FSM. While in Kosrae he met with veterans and their families for a get together at Bully Hayes’ Restaurant and enjoyed local food and talking with the Veterans. 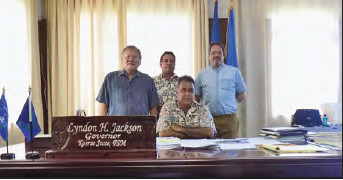 That Monday he met with Kosrae State Governor Lyndon Jackson and Lt. 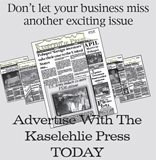 Governor Carson Sigrah followed by a hearing at the Kosrae State Legislature and a luncheon. At the Legislature Rep. Ito and PREL CEO Paul Hadik talked of the struggles COFA vets are facing and what opportunities are becoming available to remedy these issues. Later that night Rep. Ito met with both Kosrae State National Congressmen, Paliknoa Welly and Alik Alik to find opportunities to get the FSM National Government involved and plan a larger meeting in 2018. In Pohnpei, Rep. Ito was able to meet with Benito Cantero, Director of Public Safety. Cantero is an outspoken veteran. During his meeting Rep. Ito once again heard the same struggles that Veterans are facing when they can’t afford airfare for medical checkups or are deprived of some of their benefits due to living in the FSM from where they were recruited. At the end of the trip Rep. Ito said, “I just want to express my deepest gratitude for the warm welcome I received from my arrival and departure. The reception I received from the Military Veterans and their families the first night was overwhelming. I really enjoyed myself. Mahalo for such an honor. “I am convinced that the treatment of the Veterans by the US Veterans Administration is unacceptable and needs to be addressed. “Meeting all the local and National government officials and sharing information and ideas to better the conditions for all the Micronesians was very encouraging and productive. “Kosrae and the rest of the island chain (of the FSM) is such a beautiful place on this planet and I hope everyone will work to keep it as is. Representative Ito continues to work to better conditions for veterans from the FSM.